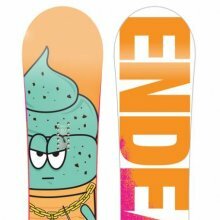 The Endeavor Color is a fun playful poppy freestyle to mountain freestyle board. The last time I rode this board it was a slightly tweaked continuous rocker but since then it’s evolved into a hybrid camber shape. We hustled up but a taste of this board at the end of the demos and we hope to get a lot more into it in the future. The Endeavor Color is a rather unique board. 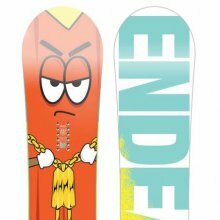 Endeavor says it’s a jib board with a stiffer flex so it can handle a riding out of the jib park. It also has continuous rocker between the feet and then a flat shape. This was kind of a unique feel that felt kind of similar to a flat to rocker board instead of a rocker to flat board. Although we didn’t feel this was a jib board we did feel it was a pretty good freestyle ride. Riders: Stephen and James. 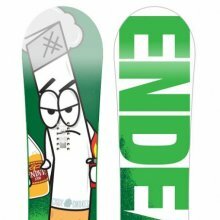 We both rode this board at a bout 23″ wide 15 front -15 back. Conditions: Hard early season snow with some softer patches and places had some bumpy crappy terrain as well. Endeavor isn’t too noisy on the other side of the Canadian border and they aren’t well known in the US. You have to look for em and want to ride something different. Hard to find doesn’t always mean good but this wasn’t a bad little ride. The design is rather unique. not really flat to rocker because the rocker is between the feet so to us it could best be classified as continuous rocker instead of flat to rocker. It has stability between the feet just a shade below flat to rocker and it’s better than continuous rocker. 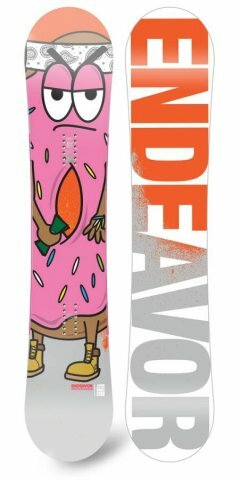 This was a lively and pretty playful freestyle board that bordered on an all mountain freestyle ride. 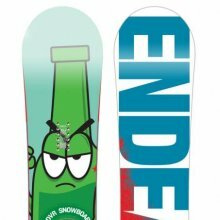 On Snow Feel: The feel between the feet feels like rocker on harder snow but there is a little more stability going on than a standard continuous rocker board. It feels almost like a flat to rocker board at times but at others it reminds you it’s not as stable. It has a playful snappy personality that says try me in the park but I’m ok if you take me on the mountain for goofing around. 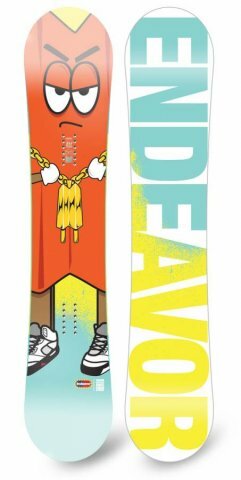 Powder: The Color is not one of those dedicated pow boards but it can take a skate board feel and all mountain freestyle like approach to riding pow. It floats ok and planes very well. Turn Initiation and Carving: It has a very playful edge to edge turn and isn’t bad on a medium radius turn. When it comes to carving and wider radius turns it’s not twitchy or awkward but it is washy just like all continuous rocker boards. You have to keep it between the feet and be very cautious leaning to far into it. It’s not a butter, carve, ollie board. It’s just a butter ollie board. Speed: So when we rode this board we were kind of surprised with how well it handled a modest straight line. The rubber in the rails might be one of the reasons or the medium flex or both but what ever the tech that made this we liked it. Very good ride for a somewhat loose park board. Uneven Snow– pretty good with what we encountered and I could see the conditions getting a lot worse before not wanting to be on this board. Approximate Weight– Felt pretty light and easy on the foot. Edge Hold: Now this is better than many rocker or hybrid boards we tried but it could use some work here if you are going to use this as an all purpose freestyle board. 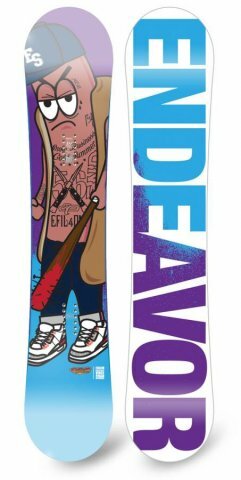 If you are down for just the jib park then you will be ok. We found the edge hold to be good for most good condition riding. When we came across snowment there was slippage and that was un-comfortable. We’d say it’s closer to the average side of Good. Switch: This is pretty easy switch. 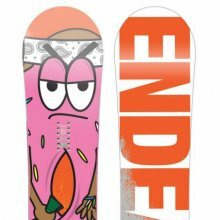 It seems that the nose and tail aren’t exactly the same but we’ll trust Endeavors description of this board being a twin. 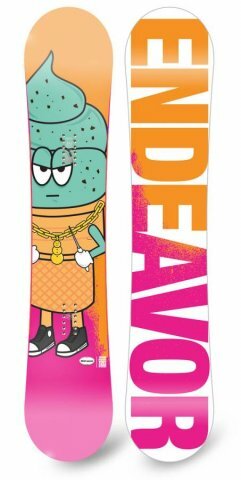 Rails and Jibs– We felt the Color can handle riding the jib park but it wouldn’t be our top choice due to it’s medium flex but many will really appreciate this all mountain jibber ride here. Pipe: It’s forgiivng from wall to wall but it’s not really a pipe board. It’s fine in a spring pipe but it doesn’t drive well from wall to wall or hold a solid edge. Jumps: The Color borders on great when it comes to jumps. It has a lively feel and not a bad spring between the feet. If you like to ollie around everywhere there are better boards out there but not that many so it should make most pretty happy with the spring. It’s very forgiving launching off small to medium size kickers and could be a good time. We try to get as many images of the Endeavor Color, but forgive us if they're not all there. I was a little surprised how soft the tips were when I got the board. And a little worried to be honest. Once I got it on the hill, those worries went away. 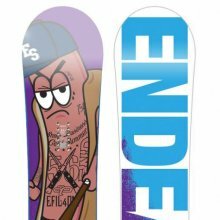 I have never ridden a board that buttered or pressed as well as this board. Not even close actually. The flex in the tips are easy to manipulate, but still offer a ton of rebound. It's like it's magic. Come into a press with too much speed? These tips were still able to give me the rebound I need so that the board wouldn't squirt out on me. Slow speed butters, press it with no effort and you can still get a good looking press. 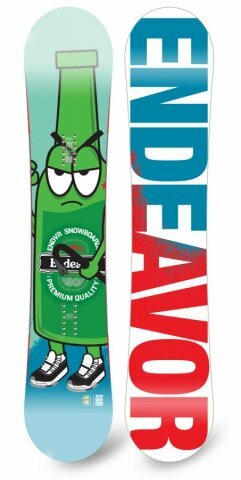 Sounds like a super noodle jib board, but I was still able to bomb the groomers on the way to the park while laying down some serious speedy carves without the board washing out at all. Even had this board out a day after a big snow day. Found lots of leftover snow and it floated like a champ! 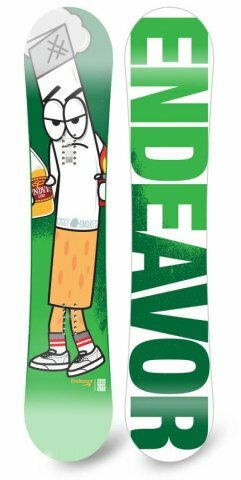 If you're looking for a park board that can easily handle the rest of the mountain. Look no further. I like it so much that I kind of want to try the KTV for comparison.